The people of Beeston were saddened yet again when news was received that Samuel Leonard Hartshorn had been killed in action. He was the 23rd member of the Beeston Old Boys to make the Supreme Sacrifice and the first member to die in 1917. It must have been a big task for the boy's mother to bring up the young ones on her own at the turn of the new century, considering she was engaged as a dressmaker on her own account and working at home. Samuel Leonard Hartshorn followed his elder brothers who were educated at Church Street School, leaving there to find work at the age of 133. It was during this time he joined the Boys Brigade and later joining the Old Boys in their senior room at the Anglo Scotion Mills premises. Samuel's name is not recorded on the Beeston Roll of Honour in the local paper of December 1915, which lists men from Beeston, Notts who were then serving in the forces. It is likely, therefore, that, like his brother Horace, he was a conscripted soldier. It is known that Samuel Leonard joined the Sherwood Foresters and served with the 2nd Battalion. The 2nd Battalion was part of the British Expeditionary Force which landed in France in September 1914, and went straight into the bitter fighting on the Aisne. On 20th September (the anniversary of the Battle of Alma - a previous Battle Honour of the 95th), the battalion carried out a counter attack to plug a gap in the British lines. The casualties were almost identical with those at Alma, 17 out of 22 officers and 214 out of 930 other ranks. Reinforced, the 2nd Battalion fought another major battle in October at Ennettiere on the way to Ypres, holding a vastly superior German force for 48 hours and losing in the process 16 officers and 710 other ranks. The winter of 1917 was a relatively quiet time on the Western Front. The Battle of the Somme had drawn to a close in the late autumn and the summer's battle at Ypres was still in the planning stage. At times like this, the opposing armies would often conduct raids on the trenches opposite. Raids would be used to capture prisoners who could be interrogated for useful intelligence. Anyone else the raiders came across would be killed. The threat of raids was constant and it meant men could never fully settle. It was also a good way of keeping up the fighting spirit of those raiding. In the early hours of the 9th February 1917, British artillery and trench mortars opened fire on No Man's Land, battering down the German barbed wire. The barrage then rolled forward a little way, now falling on the German front line. Other artillery pieces fired a protective smoke barrage. Dashing across No Man's Land just behind the barrage were 100 men from "C" Company. The Battalion's War Diary, held at the National Archives records that when they got across they found that "part of the enemy front line could not be distinguished have been obliterated by our shells.The party remained a considerable time in the enemy's line and penetrated 200 yards and bombed or blew up 20 dug-out entrances. The enemy showed little disposition to fight. Eight prisoners were captured, including three wearers of the Iron Cross. They all belonged to the 26th Regiment (mainly Saxons)." It had been a fairly successful raid although, 2nd Lieutenant Furness and nine other men, possibly including Private Hartshorn had been killed. Unusually in such raids, it was safe enough to carry all their bodies back. 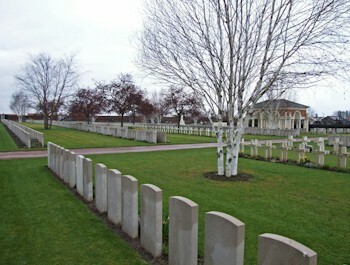 Bethune Town Cemetery - Bethune is 29 kilometres north of Arras. For much of the First World War, Bethune was comparatively free from bombardment and remained an important railway and hospital centre, as well as a corps and divisional headquarters. The 33rd Casualty Clearing Station was in the town until December 1917. Early in 1918, Bethune began to suffer from constant shell fire and in April 1918, German forces reached Locon, five kilometres to the north. The bombardment of 21 May did great damage to the town and it was not till October that pressure from the Germans was relaxed. Victoria Cross: holder Lieutenant Frank Alexander De Pass, VC, 34th Prince Albert Victor's Own Poona Horse, killed in action 25 November 1914, is buried in Plot 1. Row A. Grave 24. Shot at Dawn: Private R. Morgan, 2nd Bn. Welsh Regiment, executed for murder 15 February 1915, Plot 4. A. 17. Lance Corporal W Price, 2nd Welsh Regiment, executed for murder 15 February 1915, Plot 4. A. 18. 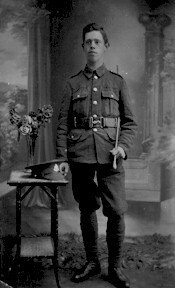 Private E Bryant, 10th Btn. Cheshire Regiment, executed for desertion 27 October 1917, Plot 6. H. 3. 2The 1901 Census for Beeston : Census Piece 3153 Folio 10. Elizabeth Ann Hartshorn (née Mewse) is shown as born in Barnack, Northants in the 1881 census (Piece 3191 Folio 65) when living at home in Stamford, Lincs with her parents. Subsequent census entries give her birthplace as Stamford. 3Research as yet to find his type or place of work. His Service Record, which would probably have given am indication, does not appear to have survived.